On Episode 344 of CrossFit Radio, host Justin Judkins interviewed CrossFit 817 owner Rob Davis and Games veteran Jason Khalipa. This episode was webcast on Aug. 27, 2014. On Episode 266 of CrossFit Radio, host Justin Judkins interviewed CrossFit success story Nicki Garcia and CrossFit Games competitor and Level 1 Seminar Staff member Katie Hogan. This episode was webcast live at 6 p.m. PDT on Wednesday, March 6, 2013. On Episode 265 of CrossFit Radio, host Justin Judkins interviewed CrossFit affiliate owners Jon Jansen and Joe Westerlin. This episode was webcast live at 6 p.m. PDT on Wednesday, Feb. 27, 2013. On Episode 264 of CrossFit Radio, host Justin Judkins interviewed CrossFit success story Irene Mejia and CrossFit Inferno owner Bill Grundler. This episode was webcast live at 6 p.m. PDT on Wednesday, Feb. 20, 2013. On Episode 263 of CrossFit Radio, host Justin Judkins interviewed Hope for Kenya project leader Dallin Frampton, as well as Justin Bergh, general manager of the CrossFit Games. This episode was webcast live at 6 p.m. PDT on Wednesday, Feb. 13, 2013. 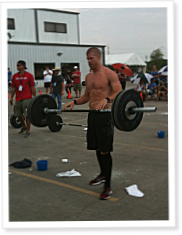 The Words of Wisdom are from the CrossFit Albuquerque blog: Advice on Approaching the CrossFit Total. On Episode 261 of CrossFit Radio, host Justin Judkins interviewed CrossFit Generation owner Barry Weidner, as well as Chase Ingraham of CrossFit’s Level One Seminar Staff. This episode was webcast live at 6 p.m. PDT on Wednesday, Jan. 30, 2013. 1:03 Justin read an email from Morgan B. about how his members generously helped a local middle-school wrestling team gear up for the season. On Episode 260 of CrossFit Radio, host Justin Judkins interviewed Rob Davis, owner of CrossFit 817, as well as affiliate owner and CrossFit Games competitor Aja Barto. This episode was webcast live at 6 p.m. PDT on Wednesday, Jan. 23, 2013.